A custom email application built to maximize efficiency. 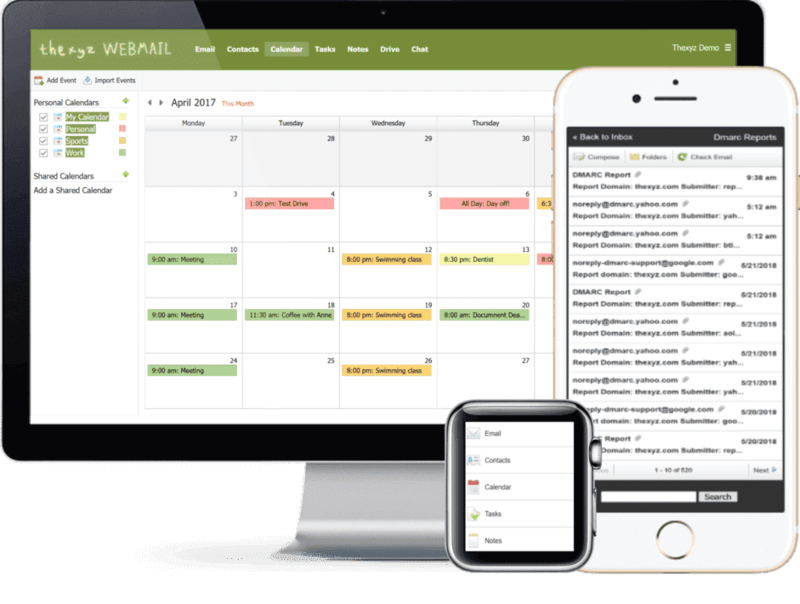 Keep on top of your events, meetings and tasks with calendars and contacts that work across all your devices. 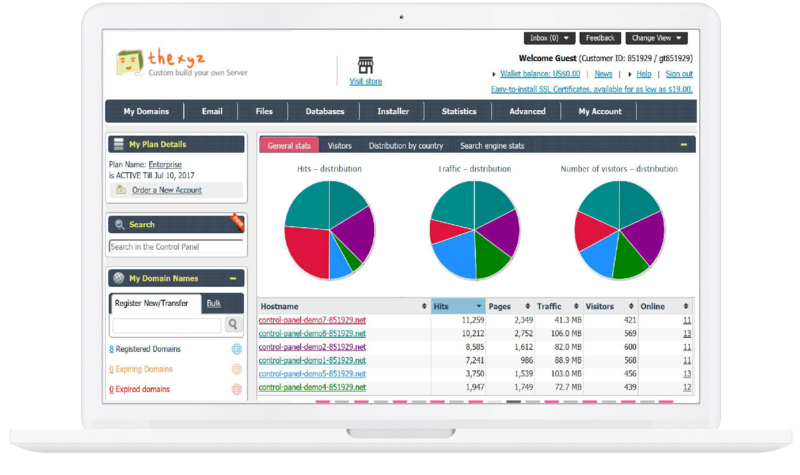 We build the best tools around for your email account and domain name management to make managing multiple email accounts simple. Access email on the web, on our mobile apps or send and receive through an email client like Microsoft Outlook. Browse our various email hosting plans. 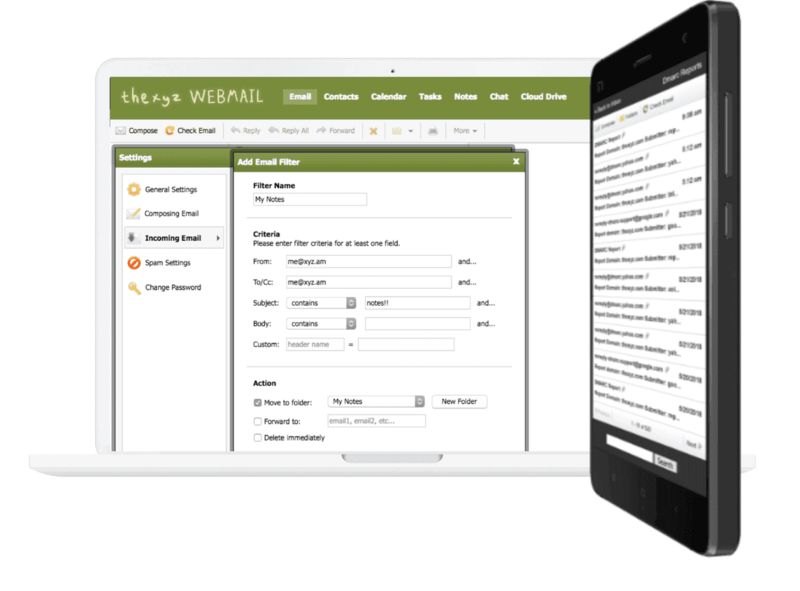 Thexyz Webmail is our flagship product and powerful enough to be your everyday — every email — messaging application. In addition to full contact, calendar and email synchronization. Enjoy the freedom of our hybrid Hosted Exchange where you can integrate Microsoft Exchange 2016 mailboxes with Thexyz Webmail all on the same domain, protected by our spam filtering. Combine the popular Microsoft Office Suite with the Office 365 email solution and benefit from our Microsoft Certified Professionals with our North American based support team. Utlize our expertise to help get you up and running with powerful collaboration G Suite by Google and our experienced support team will be your administrator - no “IT guy” required! With advanced security features and encrypted email services, you can rest assured your message contents and personal data is safe. Unlike a free email service that will scan your emails to provide you with tailored ads, our privacy focused email services are 100% ad-free and do not contain any tracking scripts allowing you to send anonymous email. Full email encryption hides data during transmission cannot be intercepted and other third parties will not access your private data. Full audit logs from the mail server are available in the email administrator control panel to see. 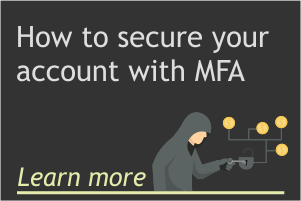 Meet compliance and keep data safe by securing passwords and setting minimum strength allowance. Secure email accounts with multiple layers of spam filtering and daily updated virus definitions, block email or ip address with professional Spam Protection..
OpenPGP PGP encryption and OAUTH RSA 4096 and RSA 2048 ECC p384 and ECC p256 FIDO U2F (Universal second factor encryption key, public key and private key) HID device. Keep emails secure with a configured and managed firewall, concentrate on other tasks rather than managing any incoming and outgoing open source firewalls. Register your own domain to setup custom email addresses and aliases. Get email on your custom domain or transfer your domain to Thexyz and enjoy the benefits of sending and receiving emails on your custom domain with no fluctuating renewal costs, free DNS hosting and strong security services that include two-factor authentication or encrypted messages. See all our domain registrations services or take a look at our Premium Domains. Register a catchy name that accurately defines your business and differentiates you from the crowd with a one of over 200 domain extensions at Thexyz. Protect your email privacy and personal information from showing in the whois with ID Protection on supported domain extensions. Premium Domain Names are high value, popular names that have already been registered but are up for sale by the Domain owner. Your trusted and reliable web host for a vps, dedicated or shared hosting plan for your website or app, we have plenty of reliable web hosting services - Plus with our Server Builder, you can custom build your server to suit your needs or take advantage of Managed hosting packages. Over 30,000 small business owners, organizations and individuals choose Thexyz to deliver the highest standards of security, privacy and reliability with our hosted email service. All our accounts include our leading spam protection and custom firewall. Email archiving and cloud storage or optional upgrades that allow for unlimited email storage and the a 30GB Cloud Drive. Ad free Webmail apps that don't read your emails and allow users to send secure and private email. Sync data with any mobile device or download our standalone mobile app and login with your email address to send encrypted email. We know that email reliability is paramount to any business. Most small businesses these days not only rely on email to send messages to intended recipients - there is also a need to archive the most important emails, schedule appointments, set calendar reminders, invite groups of people to meetings and keep track of tasks and notes. We are continually updating our host service, mailbox storage and product offerings to give our customers the very best in email and domain technology.